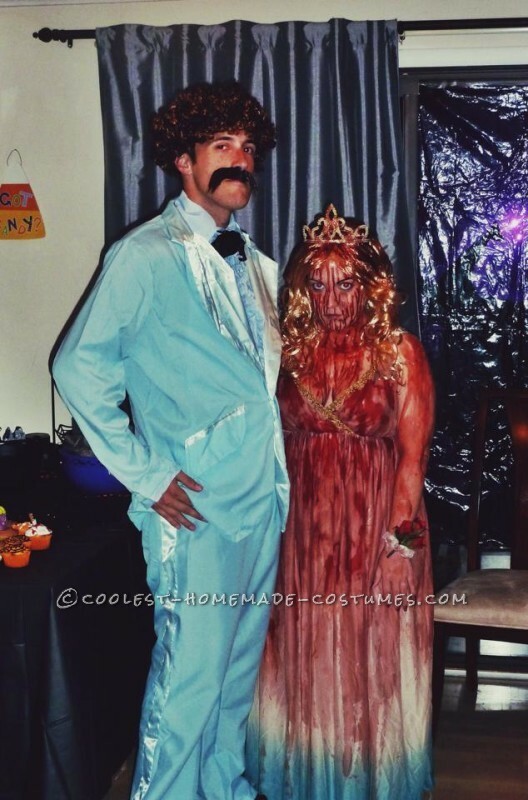 I wanted to be scary this year, I knew Carrie would help me achieve this but let me be creative! I couldn’t find a prom dress in thrift shops so I opted for a “goddess costume” that I cut pieces off of to make a generic type dress. 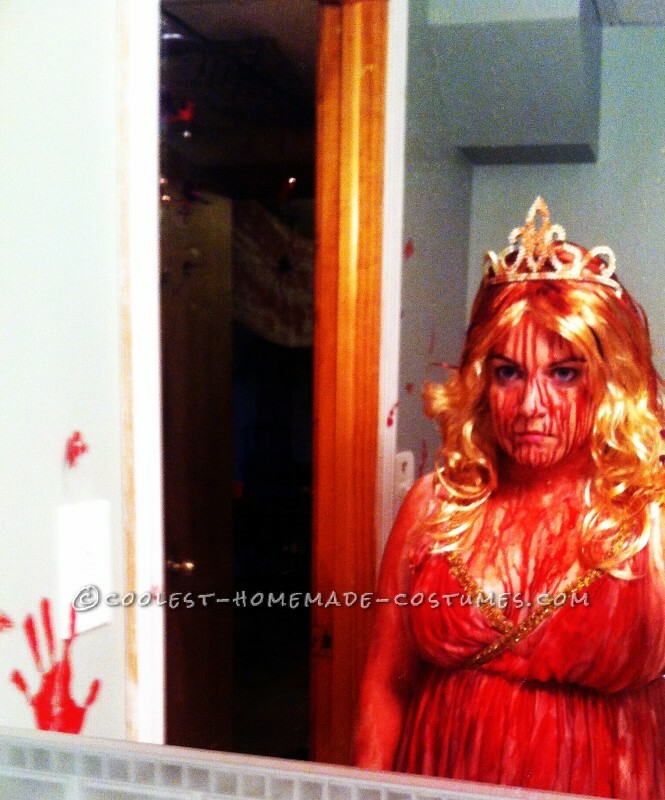 2 nights before my party I used zombie blood spray I bought at Spirit to transform it. I hung it up in the shower to make it easier for clean up. Well the dress soaked up the blood as the it dried faster than anticipated so I ended up reapplying fake blood the day of the party over the original blood. I also bought a blonde wig for $8 cause I didn’t want to put fake blood in my dark hair. I poured the blood slowly over the top and used gloves to rub it in so it would dry properly but made it look like it was dumped over her head realistically. I also sprayed my tiara I got from a dollar store and let that dry separately. (This was all dried the same day of party no problem). I made a corsage with roses from dollar store, ribbon, hot glue and velcro. I used vampire blood to drip down in slow drops down my face. I also wet my mascara after I applied to make it look like I had cried. I had my husband pour the same vampire blood down my arms as well. I used a paint brush for my chest so it really covered it without finger prints. Didn’t take long to dry but luckily washed off in 2 showers :) Definitely read the labels carefully because the bigger bottles of fake blood are definitely not meant for skin use as my hands quickly discovered. The make up blood is best for face/arms! I loved scaring all our guests all night!